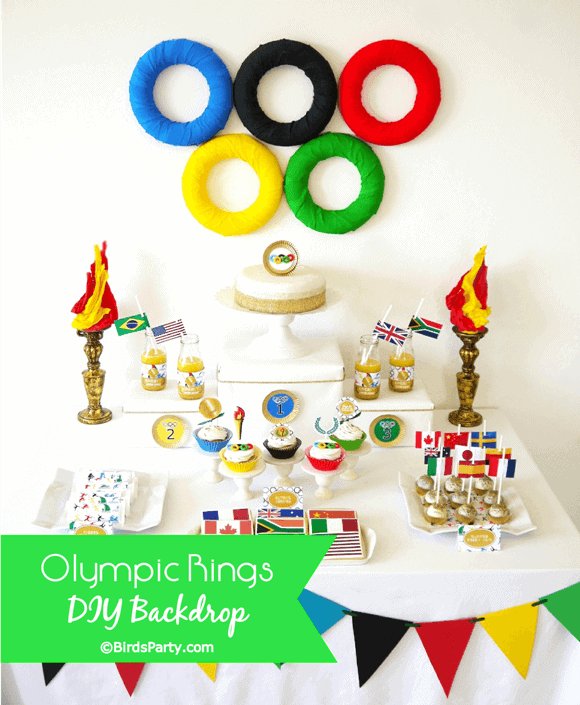 10 Simple Olympic Party Ideas - So Festive! 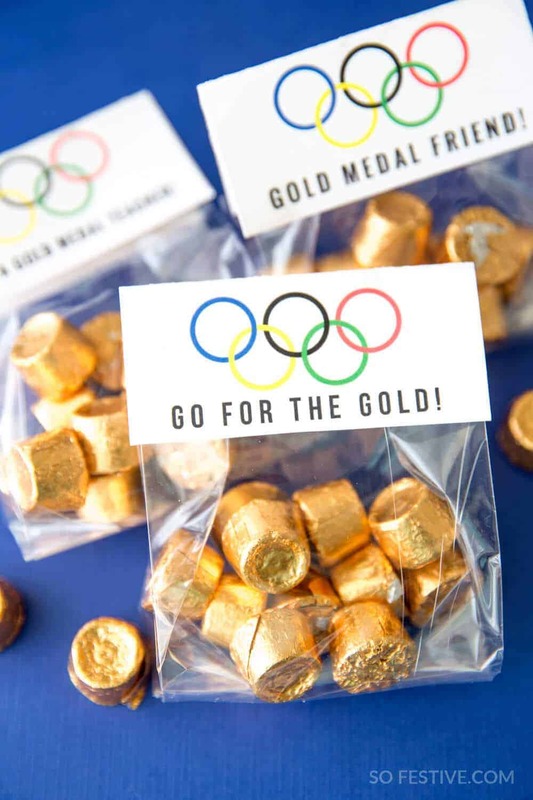 Celebrate the Olympics with these simple Olympic party ideas including party favors, Olympic-themed food ideas, games and more! So do you love the Olympics? Do you plan to have an Olympic Party? Whether you are going to host an Olympic Party during the Opening or Closing Ceremonies or just want a way to add a little Olympic magic into your daily routine, you’ll find these simple ideas to be GOLD! Pick one or do them all… a little festiveness will go a long way as you elevate the every day! Give your friends, children, or spouse the G O L D! Or set some of these cute party favors out at your Olympic Party! Get the free download here. 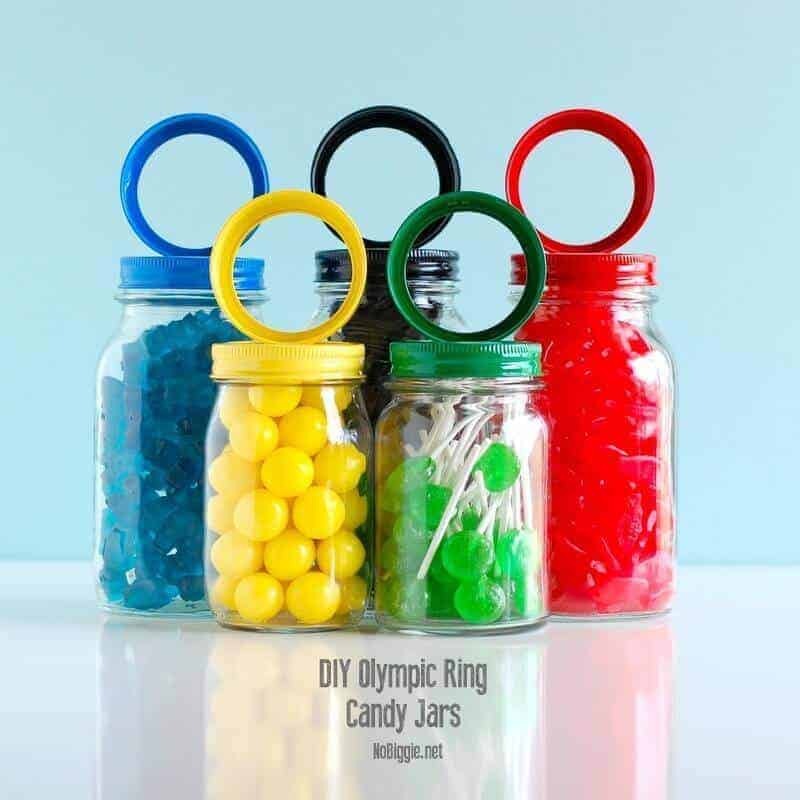 No Biggie shares this simple tutorial for creating Olympic Ring Candy Jars. These would be fun for an opening ceremony night party or just to keep up throughout the duration of the Olympics as you watch your favorite sports. These free! 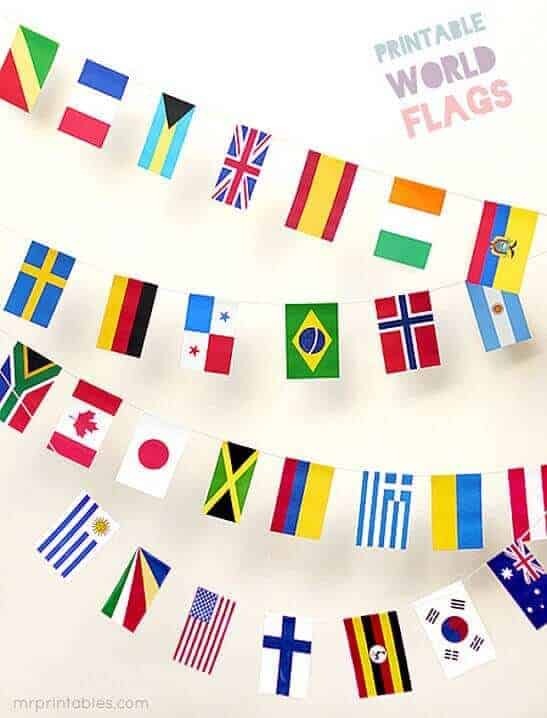 and cute mini world flag buntings would be such a simple Olympic party decoration! Make a game out of it and see if your guests can guess which flag belongs to each country. Get the free printable here. 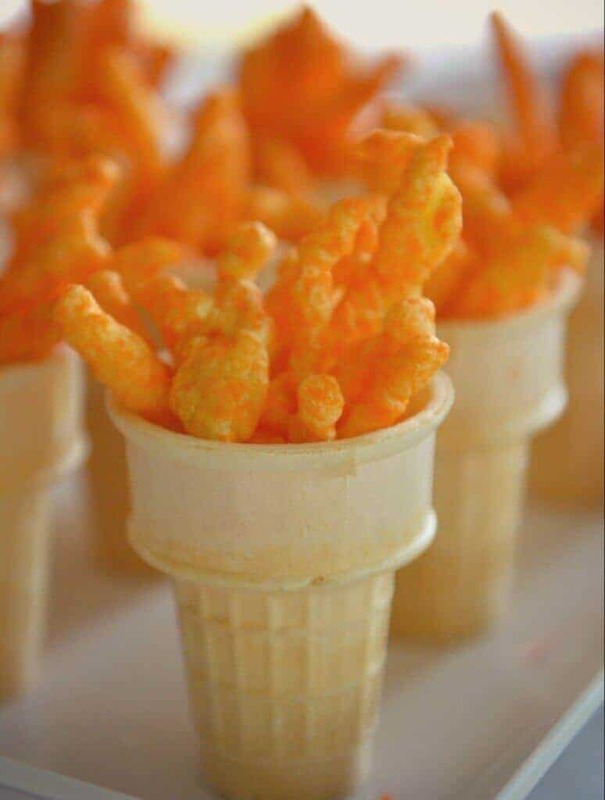 This idea via Living Well Spending Less is so cute for a lunchbox, dinner, or snack to eat while you’re watching the Olympics! 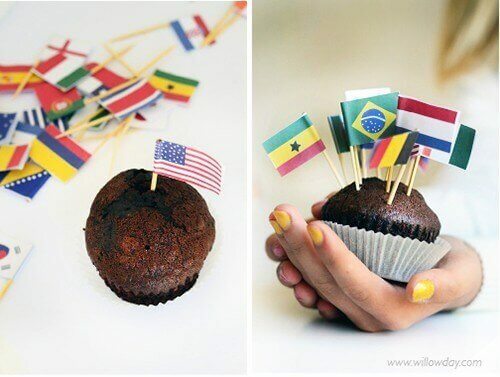 Willow Day shares these free printable World Flag cupcake toppers here. 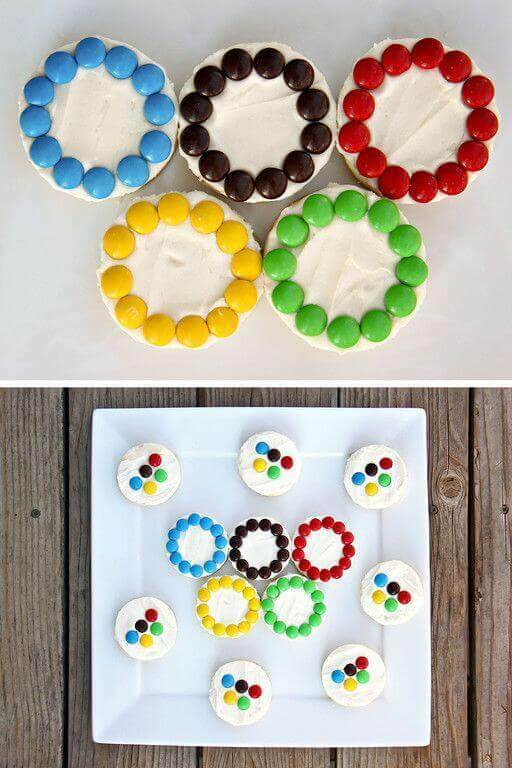 How cute are these DIY Olympic Chocolate Medals from Evite? 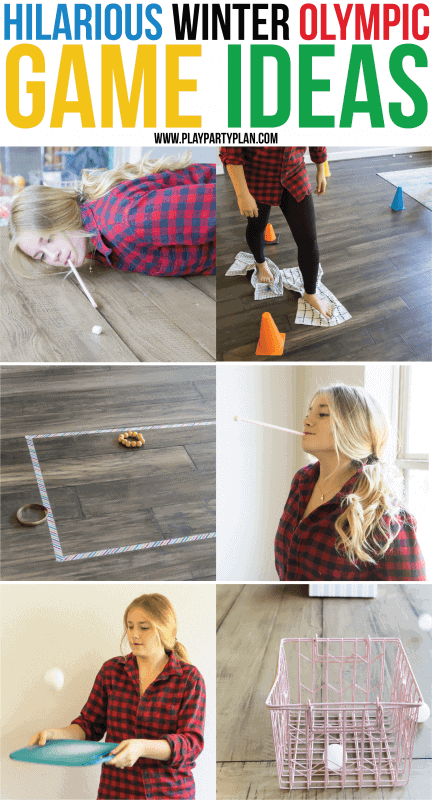 Play Party Plan has some fun Winter Olympic party games you can play at home! I’m adding some of these our list! 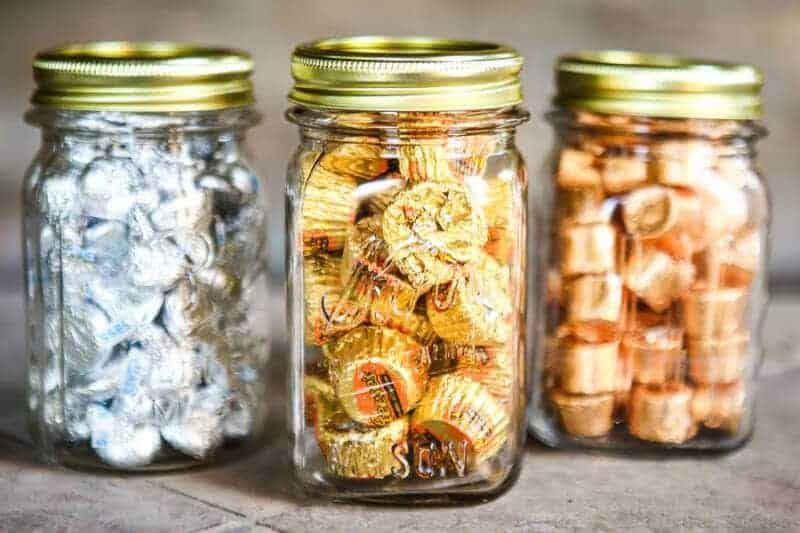 For a simple party game, have Gold, Silver, and Bronze Guessing Jars! Have your party guests guess how many candies are in each jar and whoever is the closest, wins! These candy-filled jars would also make really cute Olympic party prizes. Make some memories celebrating the Olympic Games! Find the Olympic TV Viewing Schedule here! How to Celebrate Chinese New Year Simply!